When did you start playing table tennis? What was your influence to begin playing? Started playing at age 5. My father started me in the basement of our home. What were some of your best career wins in your earlier career? You had a number of top level wins with the US Team at the 1995 World Cup in particular. Which wins stand out as being the ones you are most proud of? Most memorable win- Defeating Damien Eloi in 5th and deciding match of World Team Cup quarter-finals in 1995 in my home state(at the time) of Atlanta, Georgia. The energy of the American crowd was amazing and they inspired all three of us on the team to play over our heads. What were your major goals in that stage of your career before you were forced into retirement? Goals at that stage of career was to become a world top 20 player. How did it feel to be forced into retirement so early in your promising career? My forced early retirement was heart breaking only because it happened so suddenly as I was beginning to attain my best results. How did the big comeback begin after 8 and a half years out of the sport? What was it that kickstarted the momentum? Comeback began at the beginning of 2012. I was watching the U.S. Championships final live online and that gave me an itch to pick up a racket. I didn't intend on returning at that moment...just wanted to play once as I had not touched a racket in 8.5 years. Once I picked up a racket for the first time it was like a drug...I wanted more. When you first returned did you see yourself as having a chance of making a big comeback again? My first return to Nationals was 2012. I knew I couldn't win there, I just wanted to see how far I could go. I had a desire to see how good I could get again within the first two weeks of playing at my club in 2012. Your major breakthrough was winning the 2014 US National Championships, 21 years since your last victory at that event. Did the possibility of that happening ever cross your mind during the event? How did you feel level-wise in comparison with the rest of the field at that event? At the 2014 Nationals I felt I had a punchers chance. I wasn't the favorite, but I knew I was one of the best 4 players there, even though my US Rating claimed otherwise. 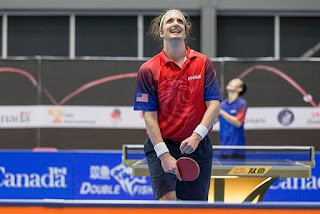 I was very disappointed in my previous (2013) Nationals result losing in the round of 16 to Yu Shao. That fueled me to see if I could perform better...I was humble but hungry. I had a good draw due to top seeds losing early...I took advantage of it. You won a bronze medal at the North American Cup in 2014, did you feel that was a significant factor in your comeback. Returning to the North American Cup in 2015 where you won the gold medal, did you believe you could achieve that result? I'll tell you a story of the 2014 North American Cup that I believe helped me win in 2015...at the 2014 NA Cup the Canada organizers made a very bad and unfair schedule. Initially everything was fine, but they decided sunlight was affecting play through some high windows, so they changed the schedule and made me play 4 matches in a row with zero rest(in order to finish all matches while sun low in sky). The sunlight problem was fixed before the tourney started (they put shades over windows)but the organizers decided to not change the schedule back to normal because they didn't want to put in the effort to correct things back to the original times. In my group I lost 1-3, then I won 3-2 and advanced to round of 16. Immediately I played a 4-3 match, then immediately they made me play the quarters where I won 4-3. That's 23 games in a row. I was 43 at the time, and that is too much for me, and unfair to make any athlete do that. It caused me to cramp badly and the organizers then made me play the first semi final (instead of the 2nd) in the evening against my teammate Kanak Jha. I pleaded to let me play 2nd, as I was cramping so bad I could barely move and any extra time would be helpful. The organizers agreed, but said I must ask a Canadian in the other semi if it's ok( I wont name his name). The Canadian knew I was hurting and said no. I was forced to play the semis first, and I could barely move and was humiliated losing easily 4-0 to Kanak Jha. I asked to default before the match due to cramping but I was told I'd get no prize money. 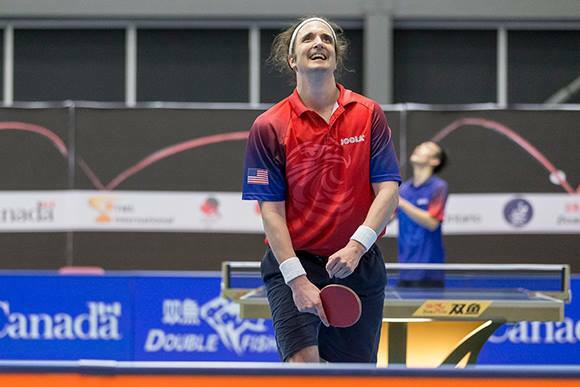 I sucked it all up after losing in the semis, but I was mad inside, and I felt like I was treated unfairly and was disrespected as an athlete. I never forgot that, and in 2015 I had a chip on my shoulder. I did not feel I played well up until the final, but I had great fight and played with all the energy I could muster. Things went my way in 2015. In the modern era of the game and with the introduction of the plastic ball how do you feel your style fits in, mainly in terms of effectiveness? Have you made any major adaptations to the way your play since coming out of retirement? The new ball has had no effect on me personally. The game is more advanced with the bh banana flip, inside out service and the powerful bh looping game of so many athletes. I have adapted by learning how to do these things, although I don't do them well enough yet. In terms of effectiveness with my game, I'm old school on my bh side off topspin as I like to flat hit everything. Although looping is better, I naturally hit better and have no choice but to do that...if I'm doing it well it is effective. Your return to the US Team and successful run straight from the word go on your comeback mission has really spurred a lot of attention to your story. How would you sum up the journey back from injury so far? My journey back from injury has been very fun and inspiring for me. I was at a big disadvantage early on because all aspects of my game were so bad and rusty. I did nothing well, and it was going to take a lot of effort to regain a decent base to start with. However, I have a big advantage in that I am very good at not only fixing injury, but at reversing muscular tightness...a form of de-aging of the body from a muscular point of view. Although it takes time to do this, it gives me the ability to play on into my 40's, and 50's if I choose. I will not get slower as I play, rather I continue to get healthier and a little faster each year. This can be done to anyone...eventually more athletes will discover this, and the future of all sports will see guys playing into their 40's and 50's with a great degree of health. Where to from here? There are endless possibilities given your current platform and results so far. What are you aiming for? You have to World Cup soon, what are you hoping for there? From here I will continue to make my body healthier, and I will continue to put in time in the practice hall. I want to keep getting better. If I work hard and stick with it, I know the results will come. I always try and follow my Coach Stellan Bengtsson's advice..."If you do everything you can to improve in the practice hall, then no matter what happens in competition, you can hold your head high afterwards knowing you did all you can do." I have no high expectations at the World Cup. I am the last seed, and my goal is to put up a fight and not get embarrassed. Michael Jordan when I was a kid. a great story !!! a great champion !